This week I have installed the carlings. 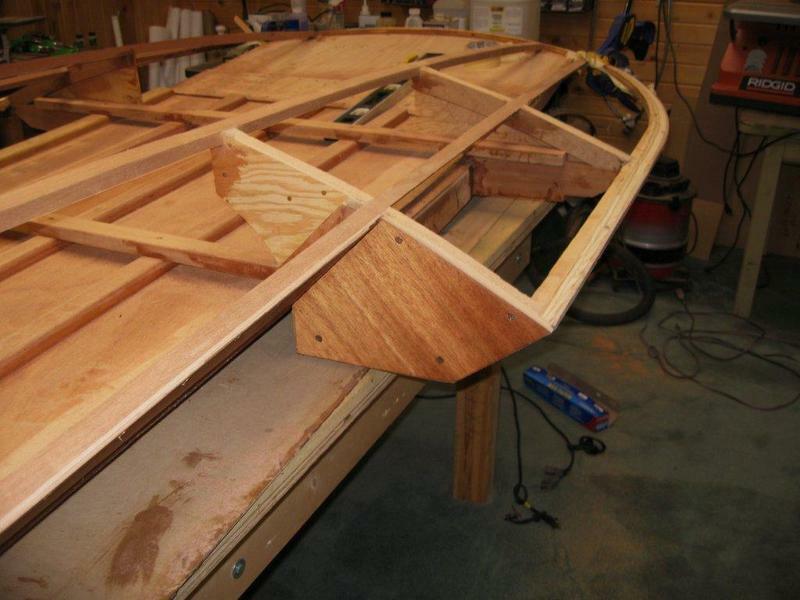 The plans call for anchoring them to the bow piece, then bend back into the frame notches and into the transom. I found that doing the reverse also works well and is easier to make the curve aft of frame 1 into the transom. 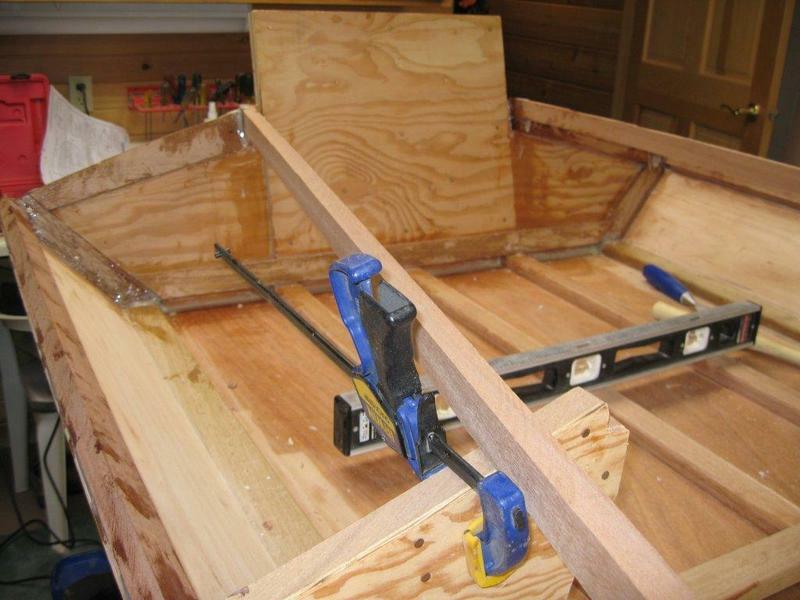 I made the compund cuts in the ends of the carlings at 10 deg for the side and 15 for the transom. Yesterday the ends of the carlings were glued and screwed into the transom and I splayed them out over frame 1 at about the level of the notches. My plan was to let the glue set up, then bend them into the notches and clamp at the bow piece. This worked very well and they were very easy to place. Today I notched the ends for the bow piece, clamped them in place, and drilled pilot holes for the anchor screws. Once I was satisfied with the fit, I removed the carlings, glued up the notches, reclamped them in place, installed the screws, and cleaned up excess glue. Now the topside is ready for fairing and fitting of the decking. Here you see the end of the carling glued and screwed into the transom. 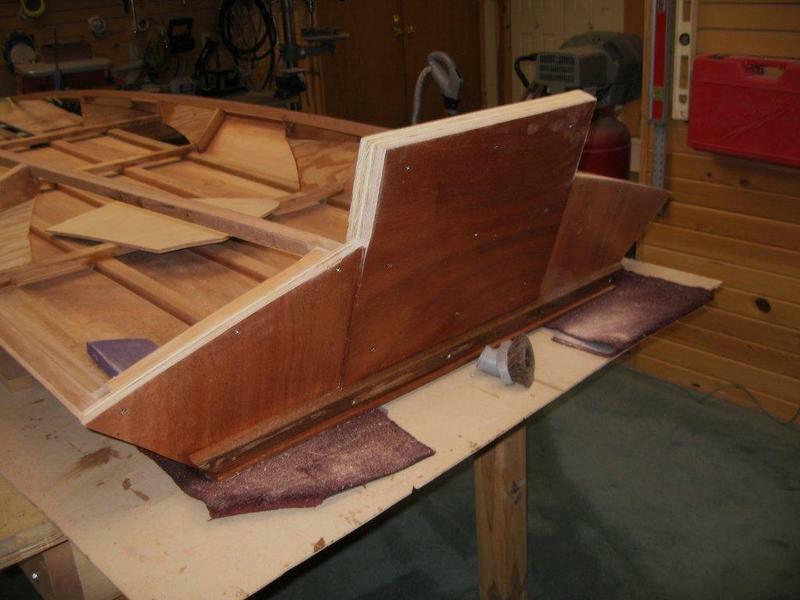 It is splayed over frame 1 at the level of the notch so that when sprung over later, it will rest level with the transom. Here the carling is sprung into position and clamped in place. The curve created by the carling was easy to do this way. 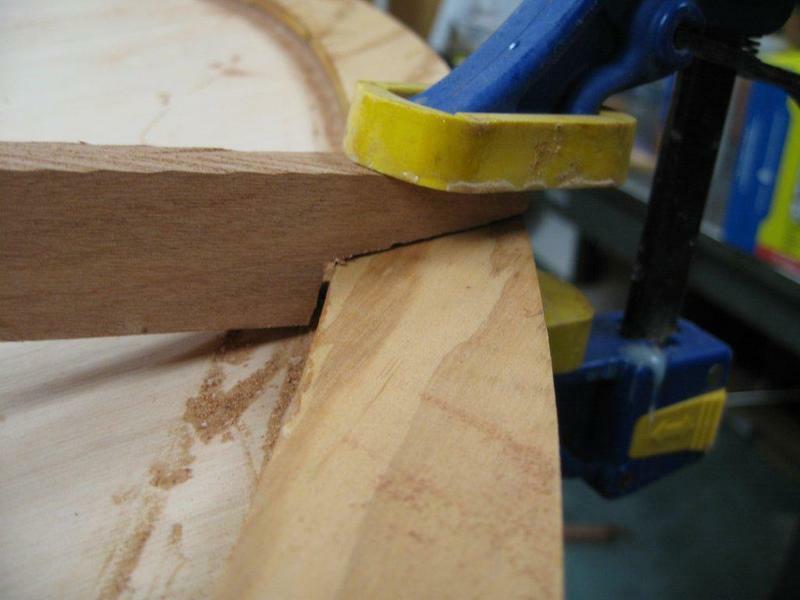 The notches in the ends of the carlings are hand cut and shaped so they will fair into the bow piece. Here the carlings are set and clamped with the joints glued and screwed. The next step is to fair the top for the decking. I had some time this afternoon, so I decided to cut the coamings from the two 12 ft boards I ordered. Wow, African mahogany is a lot heavier than Philippine. I would have preferred the Philippine, but shipping for just a small amount was way too much. I just about halved these boards and they will also be planed to 1/2″ thickness, so that will help. Not wanting to do this twice, I screwed the two boards together, transferred the pattern to the top piece, and cut them out together with my sabre saw. A little dressing with the belt sander and I now have two coamings that are identical and very little more work than cutting just one. Pattern transferred to top piece ready to cut out both. Two pieces ready to fit into the Super Spartan. I have a little more touch up sanding to do, so I left them together. I did a lot of fairing with my power planer, then started in with the belt sander today. I wasn’t happy with the look of the DF plywood transom or the ends of the sponsons so I covered them with some Okoume ply. Much more estectically pleasing. DF is OK, but I much prefer the Okoume for it’s color, light weight, and the cores are much more solid than the DF. You get what you pay for as the Okoume is two to three times the price of DF. Once everything is faired, I’ll dry fit the rest of the deck framing and coamings. Then those items will be removed for so I can get a good fit on the decking material along where the coamings will go. With the coamings off, I can mark the decking along the edge of the carlings and get a nice close fit there. 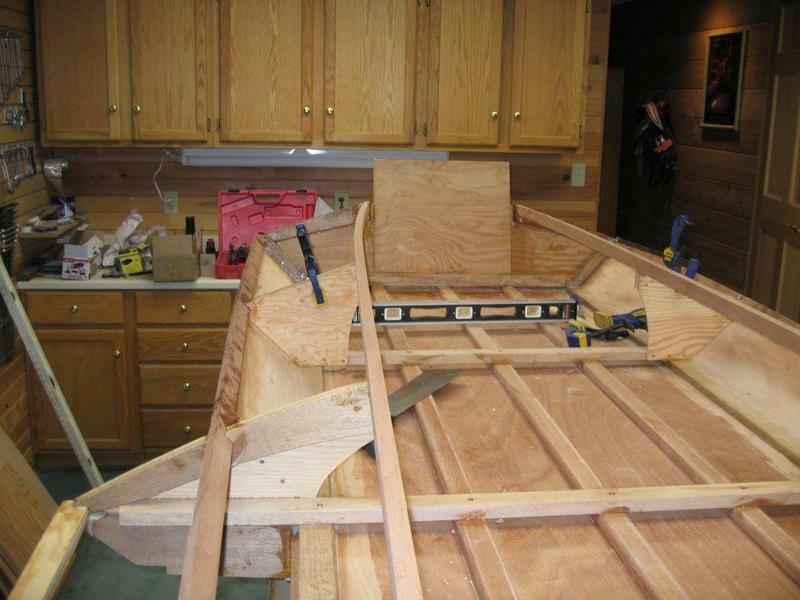 Then I can reinstall the framing and coamings and flip the boat to finish the sponsons. 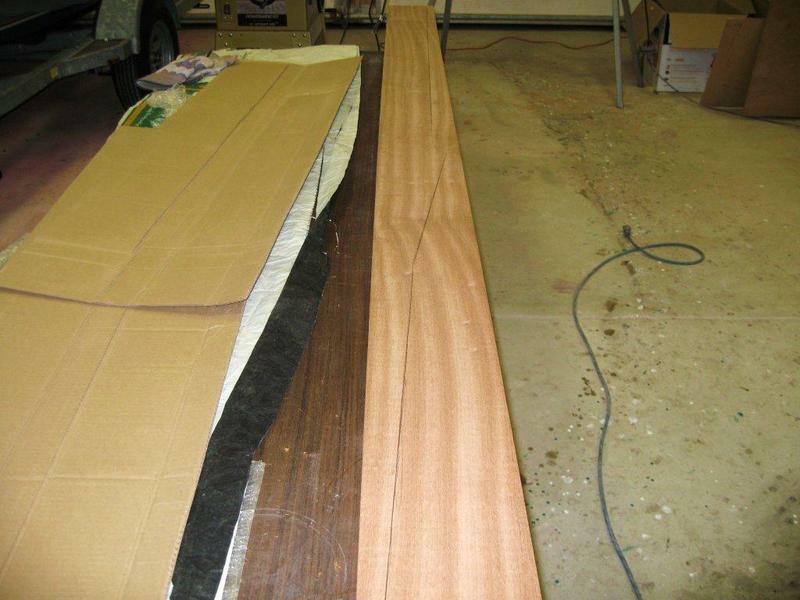 I faired the edges of the transom after fitting the Okoume cover planks to get a nice fit. 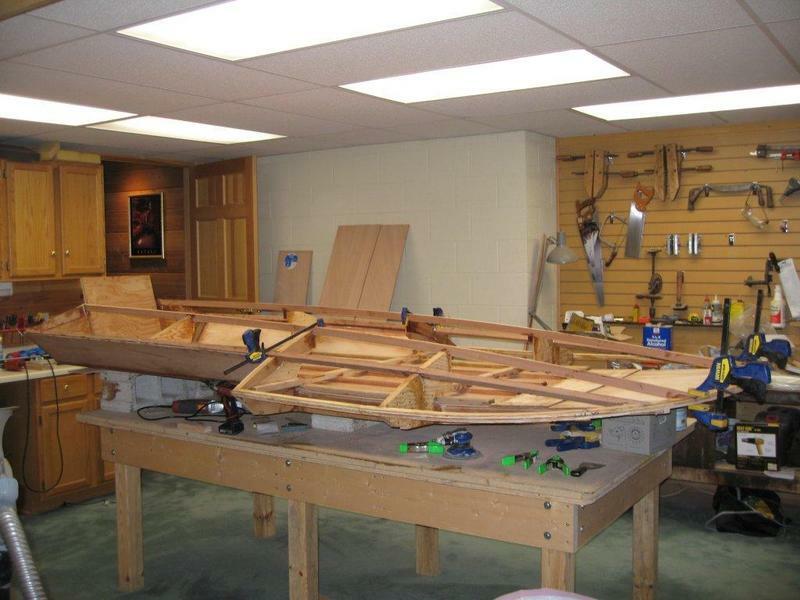 There is a slight angle faired into the transom sides to accommodate the coamings and carlings angle as they blend into the transom. Fairing is coming along nicely. Fairing nearly completed, but I need to fit in the deck battens yet. I too am building a Super Spartan and am at nearly the exact same point as this posting. 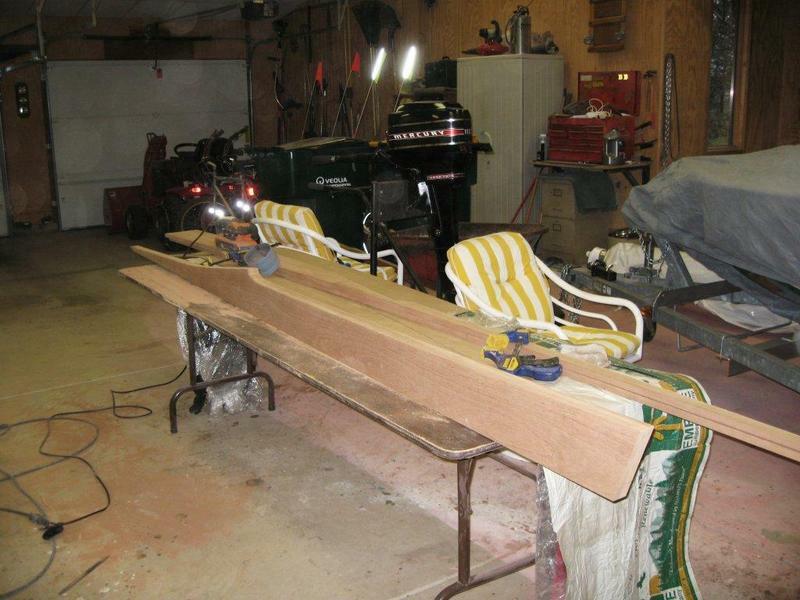 I notice in one of your pictures that the side planking extended past the transom and that you had a little bottom planking showing past the transom. On mine I noticed the side planking was approximately 1/8 in shy of the transom. I doublechecked the side planking pattern and they were correct. My remedy was to cut back the bottom battens. I’m just wondering if I did something wrong of if this was a plan issue. BTW, no fair using a power planer for fairing! I could only justify purchasing the Rigid sander for the project.